simplest projects you get done all year! If it's GREEN it's time to CLEAN! 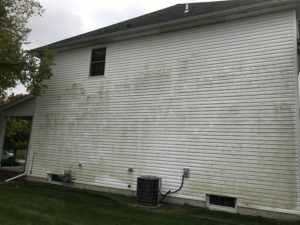 Mold, mildew, algae and moss are living organisms that are commonly found on the siding and exterior surfaces of homes and businesses. They are found on concrete sidewalks, driveways, front porches, stamped patios and decks. If left alone they will only continue to grow and spread. They are unsightly, unhealthy and easily tracked inside your home or business by foot traffic. Using our professional pressure washing service is the easy choice. Decide today that you are done living with these dirty surfaces and give us a call. We'll turn your GREEN to CLEAN. 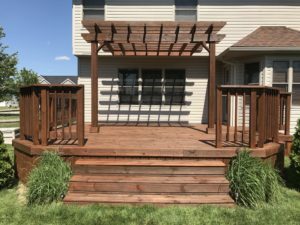 I recently had Anderson Pressure Washing clean & stain my deck and pergola. They did a fantastic job at a reasonable price. James was on-time and professional. I highly recommend Anderson Pressure Washing for your deck project. 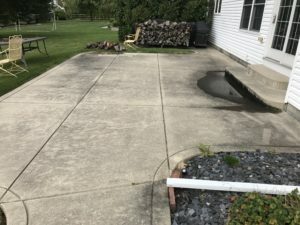 Our pressure washing service area includes: Bowling Green, Perrysburg, Maumee, Sylvania and the surrounding Northwest Ohio areas.